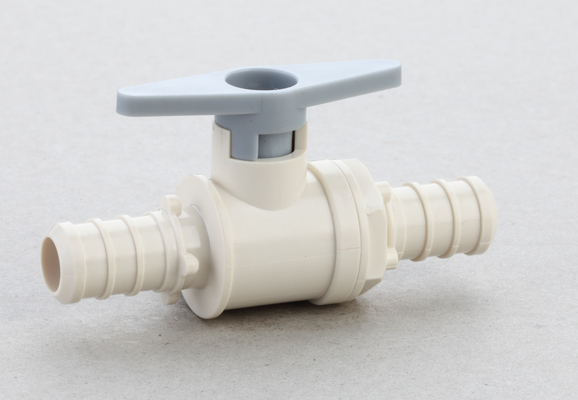 The high-performing Radel® polyphenylsulfone (PPSU) polymer from Solvay enabled China-based CiXi Zhenpeng Plumbing Fittings Company to replace traditional brass in a new line of all-plastic valves targeting pressurized hot water systems used in Heating, Ventilation and Air Conditioning (HVAC) applications. Among Zhenpeng’s new products is the industry’s first all-PPSU stop valve to meet standards ASME A112.18.1-2012 and CSA B125.1-12, as tested by the International Association of Plumbing and Mechanical Officials (IAPMO). In addition to enabling Zhenpeng’s all-PPSU stop valve, Solvay’s high-performance polymer enabled a patented one-piece ball valve and valve rod design, a half-ball valve, and L-type and T-type valves. Radel® PPSU enables Zhenpeng’s new products to eliminate corrosion and deliver reliable, long-lasting performance over the lifetime of today’s HVAC systems. Zhenpeng’s all-plastic valves and fittings are available for the U.S. market, and will be available in Europe in the near future. Solvay’s Radel® PPSU offers high fatigue resistance, strong chemical resistance and high impact strength, as well as the highest long-term hydrostatic strength (LTHS) of any sulfone polymer, making it well-suited for fittings used in multilayer piping systems that can operate under high pressure (up to 10 bar) and temperatures up to 95°C (203°F) for up to 50 years. Solvay also offers Acudel® modified PPSU as a cost-effective alternative for plumbing applications with less demanding pressure and temperature requirements.